• Test signals comply with IEC60651, 60804, DIN45657 and IEC61672 as well as several other standards. The process of verification and calibration of sound level meters in accordance with international standards is in general divided into an electrical and an acoustical part (IEC60651, IEC 60804 and IEC61672). Special national standards have been designed to cover special needs. A typical example of this could be the BS7580 or the German DIN45657 which describes the testing of time constant F down to 0.25ms; testing of statistical calculations and the Taktmaximal 3 and 5. The international standards describe tests that have been designed for type approval of an instrument design (e.g. IEC61672 part 2), but they do also include tests meant to be performed for verification purposes on a regular basis (e.g. IEC61672 part 3). 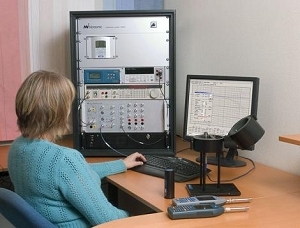 The Norsonic Calibration System for sound measuring instruments - our type Nor1504A - is mainly designed for calibration, but by using anechoic and climatic chambers etc., it is possible to apply the system to type approvals as well, since all the test signals needed, can be generated. • Total distortion in % (option). • The microphone cartridge capacitance [pF] (option). •The computer also reads the barometer, the hygrometer and the thermometer which all are included with the system in order to provide the required environmental data in a fast and accurate manner for the calibration reports. •The system permits the use of precision barometers, hygrometers and thermometers not equipped with digital interfaces. The values are then keyed in manually. •These parameters are also needed to refer the measurements to reference conditions. •A calibration is normally divided into three main parts; viz. electrical calibration of the sound measuring instrument, calibration of the microphone and - if applicable - calibration of the sound calibrator. An overall system calibration is made at the end in order to adjust the sound measuring instrument to the correct microphone sensitivity. • PC running Windows® controlling the voltmeter, signal generator, SME Calibration Unit Nor-483B and the device under test. The test is controlled by Windows® based software. The software controls all electrical tests in accordance with different standards. The microphone is removed and the electrical signal is fed via a BNC to preamplifier adaptor Nor-1447 in to the sound measuring instrument under test. This adapter has a characteristic impedance of a microphone. epending on the instrument design one of three available control modes will be used. Manual mode: The test equipment (signal generator, voltmeter etc.) is controlled by the computer. The user must set up the device under test and read the results from its display and key the results into the computer. Semi-automated mode: The computer controls the test equipment. The user must set up the device under test. The measurement values are measured with the voltmeter connected to the DC output port on the device under test and then transferred to the computer. Automated mode: The test equipment and the device under test are fully controlled by the computer. This requires an RS-232 or USB interface on the device under test. The program proposes a full set of tests, but you may, of course, run just a few of these tests, if you so wish. A total measurement report is presented at the end of the test and may be printed out and/or stored for later use. The user can add sound measuring instruments not included in the instrument libraries by writing new interface libraries or by modifying existing ones and then saving them under a new name to enable testing of new instruments. These library files contain all the necessary information like linearity range, number of gain steps, instrument accuracy class etc. The calibration of a microphone is divided into three measurement tasks: the absolute sensitivity; the frequency response and - optionally - the cartridge capacitance. All measurements are controlled by Windows® based software. The operator simply clicks on the test to be performed (absolute sensitivity calibration, frequency response calibration for the optional cartridge capacitance). A calibration certificate can be printed out once the tests selected are completed. Absolute sensitivity is measured by using the insert voltage technique. This ensures a very high degree of calibration accuracy. The calibration data is corrected for the ambient pressure, the ambient air humidity and ambient temperature. All data can be read directly into the computer via the digital interface and presented in the calibration certificate as well as stored together with the measurement results. The system is supplied with the insert voltage amplifier Nor1203 for calibrating 1", and ½" microphones and the insert voltage amplifier Nor1205 for calibrating ¼" microphones. Frequency response is measured by use of the electrostatic method. This method is a fast and reliable method and hence used to the extent possible. However, there are cartridges to which the electrostatic method cannot be applied and there are cases where the conversion factors needed to convert the electrostatic frequency response into the corresponding free field or diffuse field response remain unknown. In these cases an acoustical method can be applied instead. Electrostatic method: The microphone cartridge protection grid is replaced by an electrostatic actuator and the microphone is placed in the sound isolating measurement chamber. The signal generator makes a sine wave signal which is incremented in sixth-octave steps up to 20kHz or higher depending on cartridge type - the ¼" microphones can be calibrated up to 100kHz. The upper and lower frequency limits are user-controllable. The sine wave is fed to the sound isolating measurement chamber via the test unit in which a high voltage amplifier boosts the signal and a 800Vdc is added to generate the electrostatic field. The microphone signal is fed via the microphone preamplifier into the test unit again where the signal is amplified by 40dB and spurious noise is removed by a bandpass filter. The filtered signal is measured by the voltmeter and the values transferred via the digital interface to the computer. The frequency response measured is the electrostatic frequency response, which closely resembles the pressure response of the microphone cartridge. The free field correction is added to the actuator response curve. The measurement is fully controlled from the PC. Cartridge Capacitance (optional) is determined by measuring the voltage division ratio when the microphone cartridge forms a part of a capacitive voltage divider. A special preamplifier is used for this. Since the cartridge capacitance also depends on the polarization voltage applied, measurements are carried out using the polarization voltage the cartridge under test has been designed to work with - i.e. 200V for non-polarized and 0V for pre-polarized cartridges. Calibrators and pistonphones are calibrated in accordance with the IEC 60942 by the use of a reference microphone, designed as a WS2P as defined by IEC61094-4. The frequency and level are adjusted, whenever applicable and the calibration data printed out and/or stored on disc. The ambient pressure, temperature and humidity are enteretd into the program, where the calibration data are normalized to the reference conditions as defined by the IEC 60942. The complete measurement procedure, including verification of the reference microphone and test system is controlled by software running on the Windows® platform. Pistonphones are supplied with barometers in order to correct for the atmospheric pressure. This barometer is easily checked against the system barometer. Reference calibrators and microphones must be ordered separately. The Sound Level Calibrator Nor1253 is a Type 0L calibrator - often referred to as The Electronic Pistonphone. It has shown a remarkable long time stability, with a typically change in the SPL level of less than 2/100 dB/year. The applied principle of operation (patent pending) makes the Nor1253 virtually independent of ambient conditions like temperature, atmospheric pressure and humidity within the specified range of operation. The Nor1253 is available in a multitude of different versions. We recommend users to invest in two versions; one producing an SPL of 124dB @ 250Hz and another producing an SPL of 124dB @ 1000Hz. The reference microphone Nor1236/REF is a ½" pressure microphone with a nominal sensitivity of 12.5mV/Pa. The reference microphones have been carefully selected and measured thoroughly throughout a period of minimum nine months to document their stability. The calibration system may be delivered with or without one of the two options available for environmental conditions compensations. Systems delivered without the optional compensation will require equipment from other manufacturers. The ambient pressure, humidity and temperature must then be keyed in manually every time the program prompts you to provide these data. Norsonic offers two options for automated inclusion of measured environmental parameters. The two differ on accuracy (and hence also the price) of the barometer. The accuracy of sensitivity calibrations made on pistonphones and certain sound calibrators (those prone to significant ambient pressure sensitivity) is closely connected to the accuracy of the system barometer itself. This means that the barometer accuracy contributes to the total uncertainty of the measured values of the calibration laboratory.